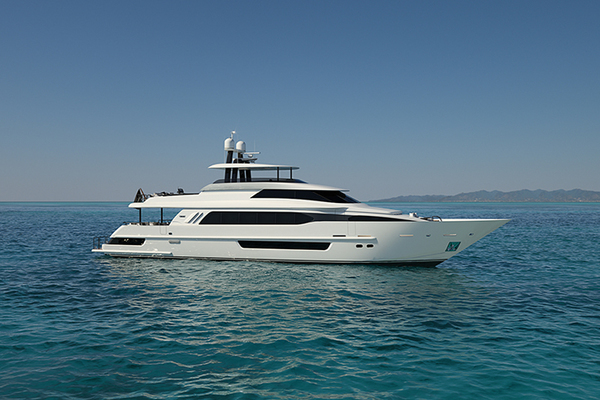 United Yacht Sales New Jersey would love to guide you through a personal showing of this 105' O. Lie Neilsen Custom 1978. 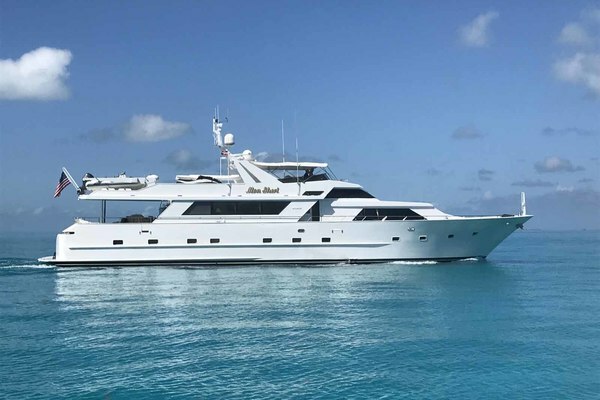 This yacht for sale is located in En Route to Newport, RI Antigua & Barbuda and priced at $2,950,000. For a showing please contact us by filling out the form on this page and we will get back to you shortly! 3 Staterooms with ensuite baths, and crew quarters for 3 plus a captain's cabin with doubleberth.Beautiful interior accommodations with exquisite detailing, finished in teak, Honduranmahagony, Alaskan yellow cedar and laminated oak, combined with satin enameled off-whitebulkheads create a traditional and comfortable ambience. Interior was redecorated in 2010/2011, all soft goods replaced and varnish renewed. Numerous cowl vents and hatches providegood natural ventilation. The yacht is also equipped with Cruisair reverse cycle air conditioning,with 4 separate compressors.A maintenance log has been kept documenting everything on the boat since November 2009.MASTER STATEROOMThe full width Master Stateroom is forward with a queen berth to port, full length mirror on aftbulkhead, drawers and cedar-lined closets to starboard. Equipped with 21" flat screen TV, BoseSurround Sound system and DVD. Also featuring private access to the deck.The Master Bath is aft to starboard with a full size laminated Southern Yellow Pine varnishedtub. Equipped with ample storage areas. The Guest Stateroom aft to starboard features two berths, bookshelves, cedar-lined hanginglocker and writing desk. Equipped with 14" flat screen TV and DVD player. Ensuite head withshower is forward.PORT GUEST STATEROOMThe Guest Stateroom to port features an upper berth forward and aft, and lower berthathwartships. Equipped with 14" flat screen TV, DVD player, drawer storage, and a deck prism.An ensuite head with shower is forward.SALONThe spacious Main Salon is elegant and comfortable with separate dining and seating areas, acathedral skylight, and full size Mendota propane fireplace trimmed with tiles.The Dining area seats 8, and is furnished with a settee, beautiful dining table and 4 chairs.The Salon is finished with polished wood and architectural features crafted from high qualitymahagony, teak and cedar. Beveled mirrors, leaded glass cabinets and Italian marble countertop distinguish the bar area. This is complemented by a modern entertainment center withlarge flat screen TV, DVD system, Bose Surround Sound, and stereo.NAVIGATION STATIONThe Navigation station with chart table, full instrumentation and nav seat is located in thestarboard aft corner of the Main Salon.CAPTAIN'S CABIN OR 4th GUEST CABINCaptain's cabin is well proportioned and appointed as well as being strategically situated aftand to port of Galley for ease of access to the cockpit. This cabin has a double berth andplenty of storage lockers natural ventilation and ensuite head as well as being finished andfurnished as per the other staterooms aboard allowing this cabin to be used as a 4th GuestStateroom should there be the need.CREW QUARTERSThe Crew Quarters are forward with separate deck access. There are 3 bunks, two are full size.These cabins share a head & shower. There is a Bosch washer and dryer in the crew area.Redesign and refinished 2015. Beautiful classic circular aft cockpit with 5' diameter wheel, wooden binnacle and Constellationcompass. Looking foward are wide uncluttered teak decks, beautiful varnished teak cabinsides, deck boxes, hatch and cap rails, all accented with chrome stanchions and stainless steellife lines. High white bulwarks are decorated with 2 bronze dolphins and bowsprit. The cockpit comfortably seats 8, protected by a full dodger, and equipped with a 24v toploading drinks refrigerator. Engine controls and B&G instrumentation are also in full view to thehelmsman. Recently painted Engine Room is accessed via large hatch on port side aft in main salon, whichleads to the tool/pump room, complete with work bench, tool storage, fuel manifold, fuel filtersand fuel transfer pump. There are 7 fuel tanks. Aft are the main engine and generator areas,watermaker and Lewmar Commander center.Main engine is Caterpillar 3126B, 370hp, new 2004, appx. 4,000 hrsGearbox hydraulic V-drive, new, 2004Panish single lever engine controlRacor fuel filters3-blade Max Prop, 34" dia., factory serviced 2016Yacht Specialities wooden spoked wheel & pedestal, chain & s/s cable steering, connecting toquadrant, serviced January 2017Engine room fire suppression system, Cert. 2017Reverse Osmosis Watermaker 90 GPH, new membranes 2017KeyPower hydraulic bow thruster, 2-blade, 15hpManual Whale Gusher bilge pumps3x 24v Rule automatic bilge pumps w/high water alarmsEngine room fire alarmHolding tank full alarmVarious spares, including pumps, seals, impellersExtensive tool inventoryHydraulic tank removed, flushed & reinstalled, 2004Fresh water plumbing system replaced, 2013, including: Aqua-pex hot & cold water high pressure tubing throughoutMach 5 silent high pressure water pumpHead Hunter waste management system, with all heads rebuilt & plumbing serviced in March2008Groco Manual Head system in the Captains Cabin 2012Seagull water filtration system in the galleyX4 independent Gray water tanks2x Stainless Torrid hot water tanks, 20 gallons each, 220v & engine heat exchangerNew groud plate, 2008Fuel tankage with total 830 gallons capacity is divided into 7 tanks: 130, 130, 110, 175, 75,105, and 105 gallon.X4 Watertanks, X3 New Fiberglass wather tanks installed 2012: 250, 150, 250, auxillary 125gallon fwd. The hull is constructed of 4 layers of native Maine cedar with an outside 5th layer of Honduranmahagony. Hull is cold molded wood with the epoxy saturation technique. The entire hullsurface on the inside and outside is saturated with epoxy resin and fastened with bronze nailsand screws. Yellow pine floor timbers, laminated white oak keelson and sheer clamp. Leadkeel is 53,000 lbs. Keel bolt nuts tightened in 2005. Hydraulically operated stainless steeldaggerboard modified in 2012. Skeg hung rudder. 2010Complete Paint JobShortening of the Main & Mizzen Masts, new standing rigging, sails, furlers, foils etc. New Winch Bank batteries.New Tender 12' Nautica inflatable2011Replace Fuel Tank under Nav StationAdd additional hydraulics for furlersNew HW Heaters.New propane fired fireplaces2012All new teak decks. TEAK DECKING SYSTEMSRemove and re-shape centerboard2013/2014Replace all bronze caprail tracks and deck tracks with new tracks.Replace the custom Decahedron overhead salon hatch with new improved versionComplete Galley refurbishment inc, new stainless counters, equipment, oven, counters,sinks, plumbing etc.2015Complete Crew area (Fo's'cle) refurbishment, new head and shower, bunks lengthened,storage solutions and finish coatings.Re-engineer anchor chain bin arrangement in fo's'cle.Replace entire custom house battery bank.Replaced all Inverters with new Mastervolt inverters.Replaced entire fuel lines and fuel transfer manifold with new.2016/17Complete new topsides paint These are only a selection of major upgrade items covered since 2009, the electronicsupgrades, engine and generator maintenance, watermaker membrane replacements, riggingreplacements, and regular varnish plus ongoing maintenance is considered regularmaintenance. Complete maintenance log since 2009 is available for perusal. CONTAINER STORAGE20’ Pines Chassi Road Container includes workshop and storage. The container includeshundreds of spares and additional equipment pertaining to “Whitehawk”. Inventory can besupplied upon request.